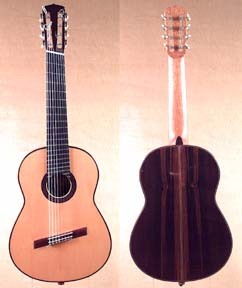 Attempts to extend the range of the guitar beyond the normal E-e tuning has always presented problems with string balance, so the request to make an eight stringed guitar which ranged between AA, two octaves below middle C and e two octaves above and which still retained both the tonal and playability characteristics of a normal six stringed guitar, required a look back to the seventeenth century and a family of brass strung instruments, namely the Orphareon and Pandora. The popularity of those instruments was short lived, mainly caused by the discomfort of playing on brass with the fingers. This problem does not arise with the modern nylon guitar string, so the idea of incorporating the asymetric fingerboard and bridge of the Orphareon was worth resurrecting for the eight stringed guitar.